As part of my patriotic duty I bring you all my latest bit of fun: a generic Australian worker’s cottage. These are quite common in certain suburbs in most Australian cities and date back to the turn of the 20th Century. I kept the design fairly simple to facilitate repetition and variation, just like the real things. I love the clothes rack. That’s great! Very nice town creation, it’s got a nice little home-ey feel to it. It’s a Clothesline (d’uh) most definetly a Hills Hoist Rotary Clothesline made from galvanised sumthin or other. Great for swinging around on until you got bigger than your brother and it ended up lopsided. 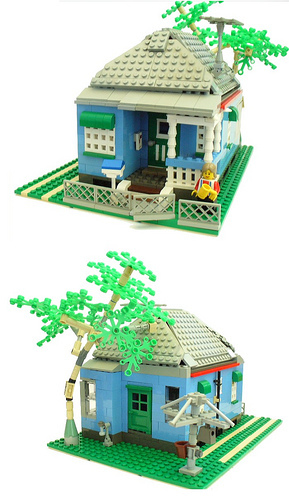 Nice to see a non-stereo typical piece of Australiana in the lego’d world. That washing line is absoulutely genious. Looks just like the real thing. Mind if I ever use that design? Love the Hills Hoist in the backyard -the only thing missing is the little kid swinging off the Hills Hoist pretending to be Superman! Simply Inspiring, on several levels. Does induce nostalgia though – between us, my friends and I have rented more than one of these great little places, Hoist included (for the uninitiated, Hoists are best utilised covered with a tarp to protect the barbie from Melbourne’s awesomely retarded weather).